Department of Mathematics, University of Qom, Qom 3716146611, Iran. 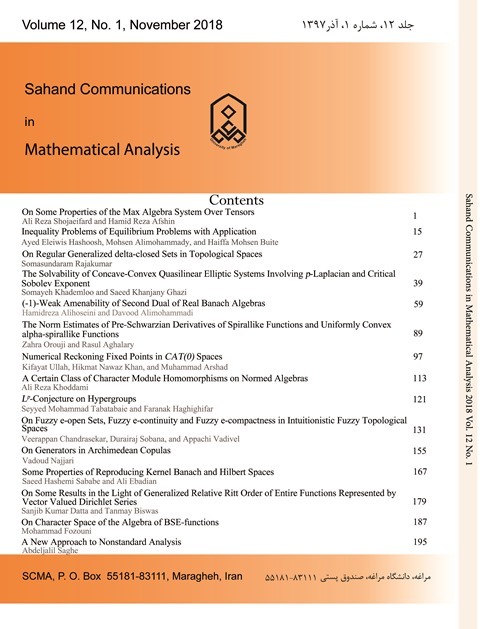 In this paper, we study $L^p$-conjecture on locally compact hypergroups and by some technical proofs we give some sufficient and necessary conditions for a weighted Lebesgue space $L^p(K,w)$ to be a convolution Banach algebra, where $1<p<\infty$, $K$ is a locally compact hypergroup and $w$ is a weight function on $K$. Among the other things, we also show that if $K$ is a locally compact hypergroup and $p$ is greater than 2, $K$ is compact if and only if $m(K)$ is finite and $f\ast g$ exists for all $f,g\in L^p(K)$, where $m$ is a left Haar measure for $K$, and in particular, if $K$ is discrete, $K$ is finite if and only if the convolution of any two elements of $L^p(K)$ exists. F. Abtahi, R. Nasr-Isfahani, and A. Rejali, On the $L^p$-conjecture for locally compact groups, Arch. Math., 89 (2007), pp. 237-242. F. Abtahi, R. Nasr-Isfahani, and A. Rejali, Weighted $L^P$-conjecture for locally compact groups, Periodica Math. Hun., 60 (2010), pp. 1-11. W.R. Bloom and H. Heyer, Harmonic Analysis of Probability Measures on Hypergroups, De Gruyter, Berlin, 1995. W.R. Bloom and P. Ressel, Exponentially bounded positive-definite functions on a commutative hypergroup, J. Austral. Math. Soc., (Series A) 61 (1996), pp. 238-248. C.F. Dunkl, The measure algebra of a locally compact hypergroup, Trans. Amer. Math. Soc., 179 (1973), pp. 331-348. F. Ghahramani and A.R. Medghalchi, Compact multipliers on weighted hypergroup algebras, Math. Proc. Camb. Phil. Soc., 98 (1985), pp. 493-500. F. Ghahramani and A.R. Medghalchi, Compact multipliers on weighted hypergroup algebras. II, Math. Proc. Camb. Phil. Soc., 100 (1986), pp. 145-149. R.I. Jewett, Spaces with an abstract convolution of measures, Adv. Math., 18 (1975), pp. 1-101. M. Lashkarizade Bami, The semisimplicity of $L^1(K,w)$ of a weighted commutative hypergroup $K$, Acta Math. Sinica, English Series Apr., 24 (2008), pp. 607-610. Kh. Pourbarat, Amenable weighted hypergroups, J. Sci. I.R. Iran, 7 (1996), pp. 273-276. M. Rajagopalan, $L^p$-conjecture for locally compact groups I, Trans. Amer. Math. Soc., 125 (1966), pp. 216-222. S. Saeki, The $L^p$-conjecture and Young's inequality, Illinois. J. Math., 34 (1990), pp. 615-627. R. Spector, Apercu de la theorie des hypergroups, Analyse Harmonique sur les Groups de Lie, 643-673, Lec. Notes Math. Ser., 497, Springer, 1975. R. Spector, Measures invariantes sur les hypergroups, Trans. Amer. Math. Soc., 239 (1978), pp. 147-165. S.M. Tabatabaie and F. Haghighifar, The weighted KPC-hypergroups, Gen. Math. Notes, 34 (2016), pp. 29-38.